As you already know, I love to make cookies. Whenever I feel like making something simple, fast and not too sweet, I choose Chocolate Chip Cheesecake Cookies – my favorite. When I wish to eat sweet chocolate ones, I always make Double Chocolate Cheesecake Cookies. For special occasions and holidays I prepare Holiday Maraschino Cherry Shortbread Cookies and Valentines Maraschino Shortbread Cookies. 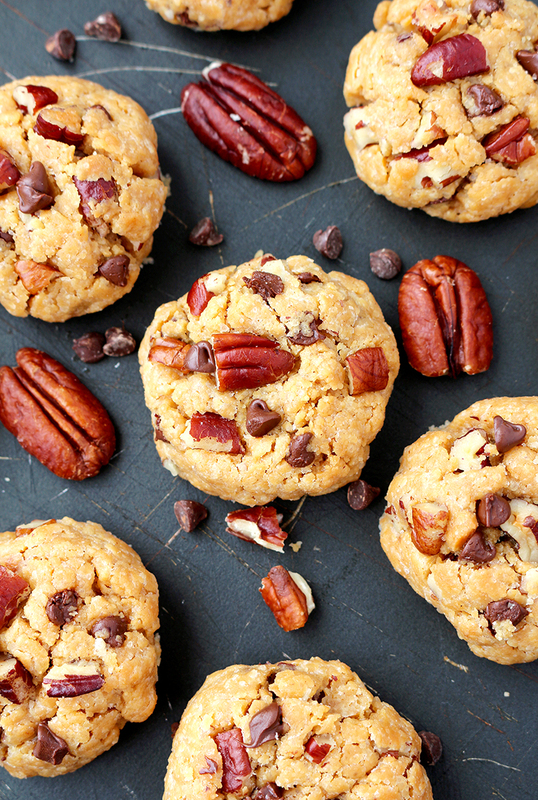 As for crunchy, quick and delicious cookies, I choose Peanut Butter Cookies with Chocolate Chip and Pecans. 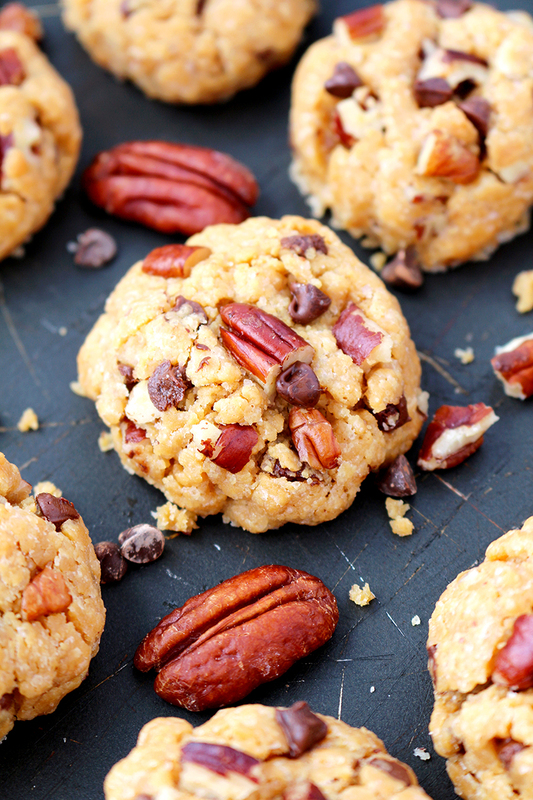 9 ingredients +20 min of your time = Peanut Butter Cookies with Chocolate Chip and Pecans. 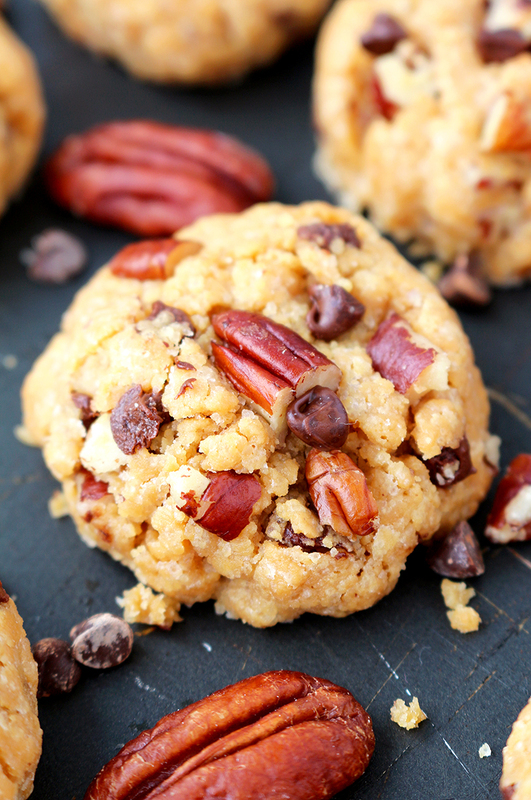 Rich taste of peanut butter with chocolate chips and pecans make a great combination. They are so soft when baked, yet crunchy later. 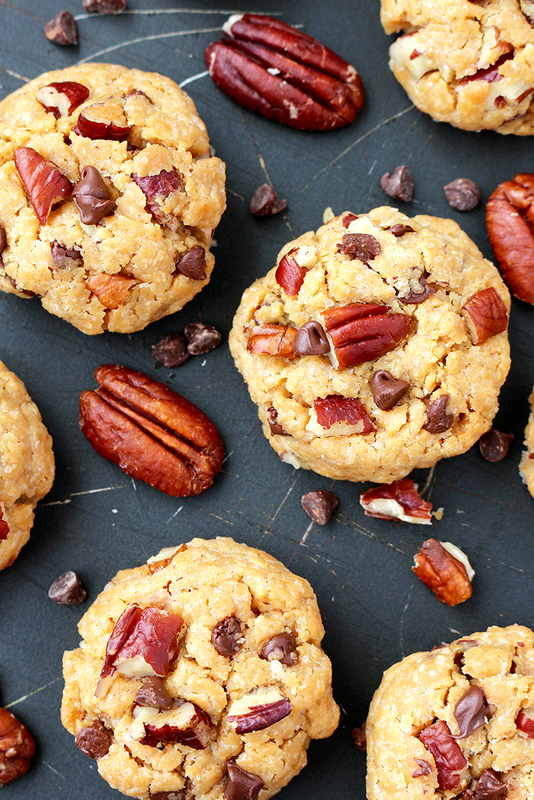 When you eat them they crumble, chocolate chips melt in your mouth and pecans crunch. Instead of pecans, some other ingredients, that you like, can be used. They taste great, even when nothing else is added. Eating these cookies make you feel full long after consuming them, because peanut butter is rich in healthy fats and proteins. It is also rich in minerals and vitamins. Be careful not to eat them too much. Peanut butter fans will probably like – No Bake Chocolate Peanut Butter Mini Cheesecake. Have a nice day. Turn on your oven, get busy and put a smile on your face… When you try these cookies you will not be able to stop smiling. Enjoy. In a large bowl combine flour, baking powder and salt. Set aside. In a mix bowl mix peanut butter and sugar using electric mixer, medium speed, around a minute. Add eggs and vanilla and mix for one more minute. Add dry ingredients in a bowl with wet ones and mix until well combined. Finally, add chocolate chips and chopped pecans and stir well (leave some aside, to sprinkle over the cookies). Make 1.75 inch balls. There will be about 30 balls.Put them in the baking sheet. Sprinkle some more chocolate chips and chopped pecans that you left aside and press a bit. Balls should be 1 inch apart. Bake for 10 minutes. Take out of the oven to cool in the baking sheet for a few minutes, then transfer to wire rack to cool completely. The recipe calls for baking POWDER under the ingredients but in the instructions it says baking SODA. Which is the correct item for the above recipe. Thanks for your observation. It’s baking powder. It says 2 eggs, but directions say to add “an egg”. Do you use both? Thank you for your note, you can add 2 eggs.